AutismHR.com is a tech-touch website designed to teach intelligent, capable writers, graphic designers, illustrators, musicians, programmers and other similarly skilled autistic adults to become gig economy entrepreneurs by capitalizing on the online freelancing platform, Fiverr.com. You may know the statistic that 1 out of every 68 children is now diagnosed with ASD (Autism Spectrum Disorder - I personally dislike the use of the word ‘disorder’ here). If you’re reading this and you’re not on the Spectrum, and you don't know much about ASD, here’s where I think you should learn: The Autistic Self Advocacy Network website. Because of others’ misunderstanding of autistic individuals’ sensory and emotional processing differences, things like in-person social interactions (especially nerve-wracking ones like job interviews) and typical employment environments, are hard to deal with. In many cases, unless accommodations are made, such a work environment can be extremely grueling and distracting for the autistic individual. Unfortunately, many employers don’t look past the often low or even no-cost solutions available to make appropriate accommodations, they simply see it as one more headache to deal with that they really don’t want. Or, they’re too afraid that the newly hired autistic individual will be inappropriate in front of clients or customers. So instead of taking the time to align both the employee and employer in a way that sets each up for mutual success, the scared employer just says, “no,” to making such a hire. Unfortunately, these are uneducated employers, and you likely don’t want to work for them anyway. However, there are many great employers who embrace and recognize the well qualified, highly skilled and often highly educated pool of employment talent available from the autistic community. These employers do a great job with programs that are designed to make the individuals and the employer successful. Those programs are great if you can be one of the 10 or 15 autistic individuals they hire each year. In other words, there are not enough of those jobs for all the available and qualified autistic individuals seeking meaningful work. As an adult you need to support yourself with a meaningful income. When I say a meaningful income I don’t mean bagging groceries at your local grocery store, unless of course that’s what you’re passionate about and see it as your long-term career. No, I’m talking about finding a means to generate income, whether full or part-time, doing something that utilizes your skills, embraces your interests and piques your curiosity enough that you could lose yourself in it as you continually progress, learn and hone your craft to build a more career-oriented future. The gig economy (online freelancing) could be a helpful solution for autistic adults in need of generating income sooner than later. With the right online platform, those autistic individuals who are great at writing, graphic design, building websites, mixing recorded music tracks or any number of other creative services can build their skills in their chosen area, grow a portfolio of professional work as well as gain entrepreneurial work experience that can attract more work and/or other potential work opportunities with employers (if that's the eventual goal). Specifically, AutismHR wants to introduce you to Fiverr.com. Fiverr is a Gig Economy online marketplace. Individuals and businesses can buy and/or sell services online through the Fiverr.com marketplace. If you wanted to sell your creative services on Fiverr, you would simply set up a free Fiverr account, post your Gig (what Fiverr calls the service you are offering), and as people place orders for your service, you fulfill them and get paid. Most services on Fiverr start at just $5, which doesn't sound like a lot, but Fiverr sellers can create add-on sales that can begin to compound the revenue of each sale beyond $5. Now, I'm not going to tell you this is super easy because it's not. It's work, but it can certainly set you on a path that is more desirable than being unemployed. Plus, I think Fiverr is the simplest online freelancing platform to understand and begin using to your advantage right away. I personally like to keep things simple and straight-forward. Also, don't expect to get rich doing this. You may likely make a reasonable part-time income from this, some who really get into it can potentially earn a full-time living from this, but in either case it's up to you and the effort you put in. Regardless, if you want to go down this path of entrepreneurship, you won't be alone. There are plenty of forums related to Fiverr and AutismHR is here to help, too. It's free to start a Fiverr account, and whether you want to sell your services on Fiverr or shop the site to buy the services of others on Fiverr, you only need one Fiverr account. Your free Fiverr account allows you to buy and/or sell on Fiverr. Fiverr's online marketplace promotes your offerings for you, so you don't have to worry about marketing yourself. In fact, the more Gigs you deliver with positive reviews of your service the more Fiverr promotes your services in its marketplace. This means you can concentrate on delivering quality service, and as a result gain more Fiverr clients. All messaging between buyers and sellers is required to stay within the Fiverr platform's messaging service (basically like an email platform within Fiverr). You are not allowed to connect with others on Fiverr and try to take the relationship off of Fiverr to sell directly to them. This is actually nice because it means if someone is on Fiverr looking to buy from you the Fiverr rules dictate that business has to be conducted within the platform -- what happens on Fiverr stays on Fiverr. This keeps business relationships simple and contained. Plus, you don't necessarily have to spend additional money to market yourself with your own website if you don't want to. Though, if you do have your own website you can point to your Fiverr Gigs and have people buy your services through Fiverr (it just doesn't work the other way around). The Fiverr platform handles all the financial transactions. You do not have to mess around with being able to accept credit cards are anything like that. Fiverr takes care of it for you. The downside is Fiverr takes 20% as their cut per transaction, which means if you sell something for $5, Fiverr gets $1 of those $5, leaving you with $4 profit. That doesn't sound great, but in my opinion it's a small price to pay considering the platform is doing all the marketing of your services for you, and you don't have to pay to use the Fiverr platform -- it's free to created an account and start selling. The nice thing about Fiverr's per transaction fees is that it's a flat rate across the board, so there are no hidden fees as you sell more. Fiverr keeps a record of all your transactions, which can be downloaded as a CSV file. That can come in handy at tax time. Also, the fun part is being able to direct deposit your Fiverr earnings into your bank account. Fiverr makes this very seamless, safe and easy. Fiverr provides you with analytics about your Gigs so you can see what's being viewed within the marketplace as well as what's selling and not. Okay, so you want to set up your own Fiverr account? Below is a curated video that walks you through how to set up your free Fiverr account. 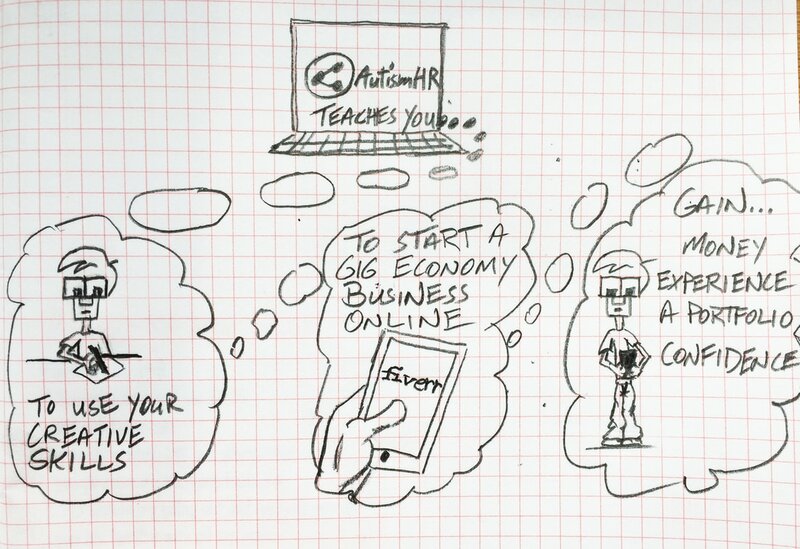 Once you have an account set up you can create your first Gig (service offering to sell). Note: The first minute of the video is the most useful for instructions on simply setting up your new Fiverr account. Once you've created your Fiverr log-in, you'll want to fill out some information about yourself as a Fiverr Seller. Below is video to explain this from the Fiverr organization. Filling Out Your Seller Profile from Fiverr on Vimeo. As you create your Fiverr log in and begin exploring the site think about what skills you have that could be turned into a service on Fiverr. It may be helpful to simply look at other Fiverr Gigs in various categories to see how others are positioning their skills to provide specific services on the Fiverr platform. It's definitely okay, and wise to view those Fiverr Gigs with a lot of positive reviews to understand how the Seller has structured their service offer, what information they provide to potential Buyers in their Gig description and even their pricing and delivery timing (how many days it takes from order to completion and delivery to the Buyer). Here are some of the most common, popular and in-demand services you could offer on Fiverr. Once you have your Fiverr log in I would suggest checking out these kinds of Gigs and think about how you could offer something similar in these categories, or if you're feeling ambitious think of some other service you could offer and get it up on Fiverr. If it doesn't get a lot of traffic it can be changed, taken down and/or totally replaced by you. You're in control here. Below is a quick video introducing how to set up your first Fiverr Gig that was curated from the internet. Here is a link to Fiverr's online support. You can see the screenshot below that shows what that site looks like. Notice the left-hand navigation links in the body of the web page (circled in red). Those navigational links will help answer questions you may have as you get started with Fiverr. 8. You Can Do This! I hope you found this information useful to help get you started examining the Gig Economy through the Fiverr platform to provide your skills as services to begin earning income and building a portfolio of great work and clients. Stay tuned to your email as you receive articles from AutismHR about Autism Entrepreneurs and Autism Employment as well as other tips and opportunities. In the meantime, you can review the Employer List that is constantly growing, if your plan is to eventually find full-time employment with an employer. Ready to Start Your Own Online Service Business?